Singer is back in the steam ironing press business with a brand new and improved model. Compare with larger 32x10" 34x11" and 36x12" Steam Ironing Board Presses below. Since the ESP-2’s pressing surface is almost 14 times larger than a conventional iron, pressing time is greatly reduced. In a fraction of the time large fabric surfaces such as table linens and draperies can have a professional-looking press. Use just fingertip force to lower the handle and a 100 pounds of pressure is exerted. Effortlessly places creases and pleats in even in fabrics that tend to resist creasing fabrics, such as jeans. With 100 pounds of pressure it is easy to remove stubborn wrinkles or press several layers at one time. Steam helps eliminate wrinkles and set creases. The ESP-2’s steam is pumped electrically from the 300ml water tank to give a true burst of steam, not just a squirt. The steam openings cover the entire pressing area, ensuring the total pressing area receives the benefits of steam. The press can operate as a dry press which ideal for delicate fabrics. The power and temperature ready indicators take the guess work out of knowing the press temperature. Choose the nylon, silk, wool, cotton or linen setting. The ESP-2’s indicator light will be illuminated when it reaches the correct temperature. The press will remain at a consistent temperature, protecting your fabrics. The alarm sounds every 10 seconds if the handle is left down. The alarm will remind you to lift the handle to ensure that fabrics are not exposed to the heating plate too long. There is ample room behind the pressing board for the holding table cloths, bed linens, draperies, and other large items as they are being pressed. If the handle is left up for 15 minutes the power to the heating unit is stopped. The safety shut-off also works if the handle is left down for 10 seconds. Automatic Safety Shut-Off offers you peace. Lock the handle and it conveniently stores in a vertical position. Weighing only 22 pounds allows the press to easily be transported. The ESP-2 has a limited 1-year warranty. Your Ironing Press is warranty to be free of defects in workmanship and material for one year from the date of purchase. Pressing will not distort the fabric grain or stretch fabrics the way ironing does. Take better care of your fabric and reduce shine commonly caused by ironing. Improve quilt-piecing accuracy by pressing instead of ironing. Pressing helps eliminate the possibility of distorting the fabric, making for more exact piecing. Projects that require fusing are more precise when using a press. 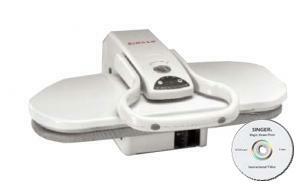 The ESP-2’s streamline design can be operated with one hand; reducing the strain commonly associated with ironing. The press can be placed on a table so the operator can be comfortably seated while using the press. DANGER-Any appliance is electrically live even when the switch is off. 1.Always unplug it immediately after using. 2.Do not place or store appliance where it can fall or be pulled into a tub or sink. 3.Do not place in, or drop into water or other liquid. 4.If an appliance falls into water, unplug it immediately. Do not reach into the water. 1.This appliance should never be left unattended when plugged in. challenged. Unsupervised use could result in fire or personal injury. 5.Children should be supervised to ensure that they do not play with the appliance. is used. Return the appliance to an authorized service centre for examination and repair . or twist cord. Let appliance cool completely before putting away. it still does not fit, contact a qualified electrician. Do not attempt to defeat this safety feature. 9.Never drop or insert any object into any opening. 11.Do not use an extension cord to operate appliance. 12.Surfaces of this appliance may be hot when in use. Do not let eyes or bare skin touch heated Surfaces. 13.Always turn the switch to the off position before plugging in or unplugging the unit. 14.Always let the appliance cool for at least thirty minutes before storing. 15.Do not move the appliance without unplugging it. 16.Unplug this appliance before filling. Do not overfill. vents, test appliance before each use by holding and testing it away from body. 18.Do not operate steamer without properly filling the water container. 19. Never yank cord to disconnect from outlet. Instead, grasp plug and pull to disconnect. unit upside down- there may be hot water in reservoir. 22.Use distilled water in the appliance. 24.Do not let the cord hang over the edge of counter. 25.Always put the appliance in a secure and level place on a table or counter when using. 26.This unit is for household use only. cord loosely around appliances when storing. 28.This appliance must be grounded. Do not alter the plug or attempt to defeat this feature. 1.The Pressing Handle raises and lowers the Pressing Plate. Handle produce a burst of steam when pressed. surface that heats and presses the fabric. clear visual indication that the unit is powered on. and deactivates to provide a clear visual indication that you are ready to begin pressing. providing you with a clear visual indication that you can begin using the Steam Burst Buttons. beneath the type of material you are going to press becomes illuminated. with the optimum amount of water. filling the Water Reservoir with the optimum amount of water. process easier and more effective in certain instances. Your Steam Press provides clean, professional results every time! 1.Place Digital Fabric Steam Press on a flat, level surface. 2.Turn Locking Knob to Unlock position to unlock pressing Plate. 3.Lift up Pressing Plate using Handle. It will automatically stay in lifted position. removed from unit; do not attempt to force it free. 5.Remove Water Reservoir Cap to express Water Reservoir fill hole. 7.Replace Water Reservoir Cap and push filled Water Reservoir back into main unit. 1.Turn the ON/OFF Switch to the"on"position. delicate fabrics first, as higher heat will cause damage to Nylon and Silks. 3.Lay fabric flat on Ironing Board. deactivates. If pressing wool, you may choose to spray with a burst of steam. This function is available once Steam Burst Ready Indicator Light illuminates. lift up Pressing Plate. Repeat until you have achieved desired crease and smoothness. 6.Once Pressing tasks are complete, immediately set On/Off Switch to "off"position. *DO NOT ATTEMPT TO PULL WATER RESERVOIR OUT COMPLETELY. 1.Hold Pressing Plate approximately 3" above Ironing Board. 2.Press Steam Burst Button to release a burst of steam onto fabric. 3.Lowr Pressing Plate onto fabric, then raise once again. 4.Repeat steps 1-3 above until fabric is smooth and wrinkle-free. FOR BEST RESULTS, PRESS BUTTON FOR 2 SECONDS AND RELEASE. 1. Lay the garment on the Ironing Board. 2. Lower the steam plate and return to the open position after a few seconds. 10 seconds in the closed position. A beep will emit until the unit is opened. Once the unit is opened, it will return to normal operation. 1. Lower the Steam Plate until it is slightly above the Ironing Board(about three inches). 2.Activate the Burst of Steam with the buttons on the sides of the Pressing Handle. 3.Wait a few seconds, and activate the Burst of Steam again. 4.Lower the Pressing Plate and then raise. 3.Place the cuffs on the end of the board and press. as you Press each section. 5.Then finish with the collar of shirt. repositioning the waistband until completely pressed. to reduce wear and prevent damage to delicate areas. 1.Placing the pressing cushion between the fabric and the Pressing Plate may help with delicate fabrics. 3.Spray bottle may be used to spray the fabric lightly. This will further help to remove stubborn wrinkles. you, over the Ironing Board, and lower the Pressing Plate. Press the fabric in sections until completed. shoulder pads, a Pressing Cushion may be used. 3.Place the area to be pressed onto the Ironing Board. 4.Place the Pressing Cushion under the dart, seam, etc. until it meets the raised area. 6.Do not force the plate to its lowest position, as this may cause damage to the unit. I have used the product several times and I'm satisfied. My wife is very satisfied with the Ironing Press -- better than the one we had before! I am thoroughly satisfied with my order and am amazed at how quickly I recieved it. I certainly would recommend you to anyone that is looking for your products. And I will most likely be buying from you again. It was a pleasure doing business with your company. Everything came as ordered and was exactly as portrayed. No disappointment.